Visual impairment has a profound impact on society. The majority of visually impaired people live in developing countries, and since most disorders leading to visual impairment are preventable or curable, their control is a priority in these countries. Considering the complicated epidemiology of visual impairment and the wide variety of factors involved, region specific intervention strategies are required for every community. Therefore, providing appropriate data is one of the first steps in these communities, as it is in Iran. The objectives of this study are to describe the prevalence and causes of visual impairment in the population of Tehran city; the prevalence of refractive errors, lens opacity, ocular hypertension, and color blindness in this population, and also the familial aggregation of refractive errors, lens opacity, ocular hypertension, and color blindness within the study sample. Through a population-based, cross-sectional study, a total of 5300 Tehran citizens will be selected from 160 clusters using a stratified cluster random sampling strategy. The eligible people will be enumerated through a door-to-door household survey in the selected clusters and will be invited. All participants will be transferred to a clinic for measurements of uncorrected, best corrected and presenting visual acuity; manifest, subjective and cycloplegic refraction; color vision test; Goldmann applanation tonometry; examination of the external eye, anterior segment, media, and fundus; and an interview about demographic characteristics and history of eye diseases, eye trauma, diabetes mellitus, high blood pressure, and ophthalmologic cares. 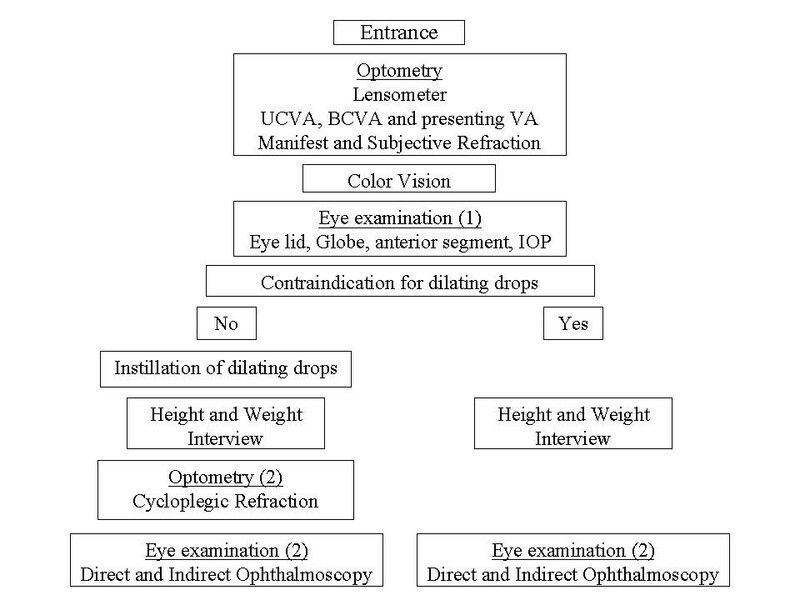 The study design and eye examination protocol are described. We expect that findings from the TES will show the status of visual problems and their causes in the community. This study can highlight the people who should be targeted by visual impairment prevention programs. Visual impairment is a global public health problem. Worldwide, an estimated 45 million people are blind, and an additional 135 million have severe visual impairment. [1, 2] The prevalence of blindness in developing countries is 10–40 times higher than in developed countries, and close to three quarters of the world's blindness is either curable or preventable. The majority of blind people on earth reside in the developing nations of Africa, Asia, and Latin America. There are several studies on the prevalence of visual impairment in the world [4–35] and Eastern Mediterranean countries. [3, 7, 31–33] Population-based data on frequency and causes of visual impairment are useful for identifying needs for treatment and rehabilitation services, planning and implementing blindness prevention programs, and determining research priorities for different populations. There are very few published studies concerning this issue in the Iranian population. Iran's National Health Survey provides data on visual impairment in this country. These data, based on self-reporting, have some limitations. The goal of the present project is to describe the prevalence and causes of visual impairment in the population of Tehran city. To determine the prevalence of visual impairment (low vision and blindness) in Tehran population. To evaluate the determinants of visual impairment within the study sample. To determine the prevalence of refractive errors, lens opacity, ocular hypertension and color blindness in Tehran population. To describe the familial aggregation of refractive errors, lens opacity, ocular hypertension, and color blindness within the study sample. The Tehran Eye Study has been designed as a cross-sectional survey in the population of the urban area of Tehran city. The Tehran region, which is a part of Tehran province, includes the cities of Tehran, Karaj, Savejbolagh, Shahryar, Shemiran, Rey, Eslamshahr and Varamin. On account of common borders and due to close economic and social links, this area is called "the Tehran region". These various cities became a collective entity in 1966, and their links have become more intensified since 1976. The 1996 census recorded Tehran region's population as 9.4 million, 6.8 million of which belonged to Tehran city alone. The sampling frame is considered the population of the urban area of Tehran city. Table 1 shows the distribution of Tehran population and families in the 22 municipal districts according to the 1996 census. It is estimated that the present total population in this area is nearly 7.5 million, but there is no evidence suggesting any change in the distribution. So we will distribute our clusters on the basis of the population size of each district in 1996. Distribution of Tehran population in the 22 municipal districts (1996 census). Census 1996 statistics showed that there were 1,660,219 households in Tehran city. Table 1 presents the number of households within each district of Tehran city. Households averaged 4.3 people in 1996.
n = 3010 × 1.5 × 1/0.85 ≈ 5300. This study follows a stratified cluster sampling strategy with proportional allocation within strata. The target population is all urban non-institutionalized citizens, of all ages, who reside in Tehran city in the year 2002. The stratification of the sample according to the 22 municipal districts of Tehran city is incorporated in the sampling process. Proportional to the number of households in the 22 districts (table 1), the appropriate number of clusters is assigned to each district (table 2). A total of 160 clusters are randomly selected based on blocks enumeration of the national census of 1996 by the Iranian Statistics Center. The decision about the number of clusters is based on total sample size; mean household members; and logistical facilities for subject enumeration, transport, and examination. For each cluster, a team of 2 interviewers (one male and one female) approaches the index household, which is specified through the aforementioned random selection of clusters, and continues the enumeration in 10 neighbor households in a systematic manner by proceeding round in a clock-wise direction. If more than one household inhabits a building, one will be randomly selected. They introduce themselves by presenting their identification cards. Then they describe the project to the present members of the households. At the end, all household members (people who have lived together in a housing unit for 6 months or more over the past year) are invited for a complete eye examination at Noor Vision Correction Center. They receive an invitation card in which the date and time of visit are clarified. The household members are informed that they will be transported to the clinic by the project staff. The enumeration teams approach clusters on Mondays and Tuesdays, and participants are examined on Thursdays and Fridays (formal weekend in Iran). Nine clusters are covered, and nearly 240 participants are visited weekly. Number of clusters in the 22 municipal districts of Tehran. Enumerated subjects who do not attend the examination process following the initial invitation will be contacted twice in subsequent weeks. Those who fail to appear even after the third invitation will be considered non-respondent. 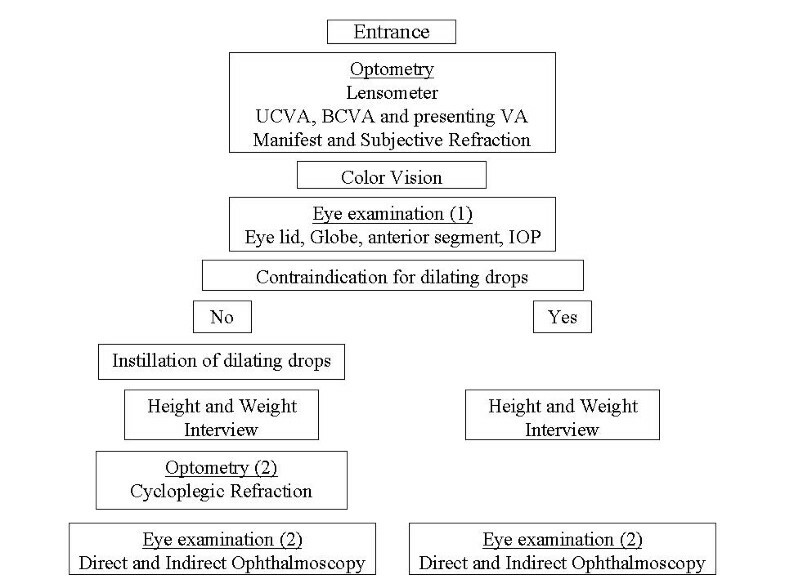 The examination protocol includes lensometry; uncorrected, best corrected and presenting visual acuity measurements; manifest, subjective and cycloplegic refraction; color vision test; Goldmann applanation tonometry; examination of the external eye, anterior segment, media, and fundus; and an interview about demographic characteristics, history of eye diseases, eye trauma, diabetes mellitus, high blood pressure, and ophthalmologic cares (Figure 1). Examination process flowchart. UCVA = uncorrected visual acuity; BCVA = best-corrected visual acuity; VA = visual acuity; IOP = intraocular pressure. An optometrist determines the visual acuity by using a NIDEK chart projector (CP – 670 20/10–20/400; Nidek Co, Gamagori, Japan) with tumbling E letters at a distance of 4 meters. Best spectacle corrected and uncorrected visual acuity tests are performed separately for each eye (one eye at a time). Presenting visual acuity is measured with the participant's habitual distance correction. Lensometry is performed by an optometrist for those who use glasses. Visual acuity is recorded as the smallest line in which the patient can read the four letters correctly. If the person is unable to read the largest E letters in the chart (20/400 E letters) at 4 meters, then finger counting is done at 1 meter. The examiner stands one meter in front of the participant and asks if the participant can see his/her hand. The examiner slowly waves his/her hand and asks the participant if he/she can see what the hand is doing. If the participant is able to see the examiners hand moving, "hand motion" is recorded on the exam form. If the participant cannot see the examiner's hand, a penlight is held in front of the participant's eye and he/she is asked if he/she can tell when the light is on. If the participant can correctly identify when the light is on, "light perception" is recorded on the exam form. If the participant is unable to see the light, "no light perception" is recorded. Care will be taken to ensure that the unexamined eye is adequately covered with the palm or cloth and not pressed. Refraction is done on all participants of five years of age and over using a Topcon automated refractometer (Topcon KR 8000, Topcon Corporation, Tokyo, Japan) by an optometrist. The optometrists act according to the instruction manual of Topcon KR 8000. Results from autorefraction are used as a starting point for a full subjective and manifest refraction. If autorefraction is not possible (especially due to a media opacity) manual manifest and subjective refraction is attempted. On the judgment of an ophthalmologist, if there is no contraindication, cycloplegic refraction is done. In this case, cyclopentolate 1%, 2 drops are instilled 30 and 25 minutes before refraction. The participants are warned about the symptoms of cyclopentolate. Using Farnsworth D-15 test, an optometrist tests color vision in all participants of at least 7 years of age. The Farnsworth D-15 test consists of 15 colored papers selected from the hue circle mounted in plastic caps. The participant is given the tray and allowed 2 minutes to arrange the hue in serial order according to their colors. Eyelid, globe, and anterior segment examination is performed at the first ophthalmologic visit. Presence of globe is recorded. In order to assess defective eyelid closure, the participant is asked to close the eyes. In cases of lagophthalmos, ectropion, loss of lid margin, etc, the lid may not come into apposition. Then the condition is specified. For all participants of five years of age and over, a slitlamp examination is done (Topcon slitlamp, Topcon Corporation, Tokyo, Japan). The participant is seated comfortably at the slitlamp with his/her chin firmly on the chin rest and forehead against the headrest. The examiner then examines the anterior segment of each eye adjusting the beam width, magnification, and beam angle to achieve the best view of all the structures in the anterior segment. In viewing the cornea, the presence of arcus and the amount of involvement, any corneal scars, lesions, or abnormalities are recorded. The sclera, conjunctiva, and iris are all inspected for the presence of any lesions and abnormalities. The presence of pinguecula and pyterigia are recorded. A pyterigium is distinguished from a pingueculum if it crosses the limbus. Iris color is determined by viewing the participant's iris with the pupil undilated using a penlight. The color is compared to a color standards developed on the basis of the standards used in Beaver Dam Eye Study. Although the choices on the form are "gray or blue", "yellow or green", "light brown", "medium brown" and "dark", the amount of pigment in the iris is taken into account rather than the actual color. When an iris has more than one color, the grade is assigned based on the color which is 50% or more. The intraocular pressure (IOP) is measured using a Goldmann applanation tonometer. A drop of tetracain is instilled in each eye of the participant and tear is stained with fluorescein. The tonometer is swung into place on the slitlamp, the blue filter put into place, and the beam width opened to its fullest height. The beam angle should be about 45–60 degrees to the side of the tonometer and should illuminate the end of the prism head. The examiner should be aware of possible contact of the tonometer with the lids, lashes, or beard; all of which may cause a "high" reading. If IOP is >30 mmHg, it is rechecked after dilation. If IOP is >40 mmHg, the ophthalmologist prescribes appropriate treatment for the participant and informs him / her about the disease. Time of IOP measurement is recorded. The participant is asked whether he or she is currently taking medication for glaucoma. If the answer is affirmative, the drug is recorded. The angle of the anterior chamber is evaluated to determine the risk of occlusion upon dilation. The examiner assesses the angle by viewing it nasally and temporally with a narrow beam directed at an angle of about 45 degrees. If the ophthalmologist feels the chamber angle to be occludable, dilating drops are not administered. When the examiner is in doubt, another examiner will be consulted. If the chamber does not appear occludable, dilating drops are administered following the intraocular pressure test. The ophthalmologist grades cortical and posterior subcapsular opacities, nuclear opalescence and color by visual comparison with a standard photograph (the Lens Opacities Classification System III, LOCS III)  through the biomicroscopic ophthalmic exam by a Topcon slitlamp (Topcon Corporation, Tokyo, Japan). All participants of five years of age and over undergo a retinal exam first using direct ophthalmoscopy followed by indirect ophthalmoscopy. The retina is examined systematically to ensure that no lesions are passed over. The examiner inspects the optic disc assessing disc size, color, vascularity, and degree of cupping. The retinal exam proceeds systematically, not overlooking any lesions or abnormalities such as congenital anomalies, signs of early age-related maculopathy, retinitis pigmentosa, vascular retinopathy, Drusen, retinal detachment, and different types of diabetic retinopathy, which are recorded on the exam form if present. The 10th edition of the International Classification of Diseases (ICD10) defines visual impairment as a visual acuity of less than 6/18 (20/60, 0.3) in the better eye with the best correction. Visual impairment is categorized to blindness and low vision. Blindness is a visual acuity of less than 3/60 (20/400, 0.05) in the better eye with the best correction. Low vision is defined as a best corrected visual acuity of less than 6/18 (20/60, 0.3) but not less than 3/60 (20/400, 0.05) in the better eye. The cause of visual impairment is identified by an ophthalmologist. Using the best judgment, the ophthalmologist will determine one cause for each eye thought to be the principal cause in either eye. When multiple disorders are present, the ophthalmologist attempts to identify the disorder causing the greatest limitation of vision. If there are any other contributory causes, the ophthalmologist specifies that as a second cause. In cases with different causes of visual reduction in the patient's two eyes, the diagnosis in the less affected eye is used. Cataract is considered the main cause of severe low vision if the fundus is obscured by lens changes, or if no evident fundus abnormalities are observed in eyes with significant cataract. Regarding the results of exams, the ophthalmologist specifies whether the participant needs any action and specifies the type of needed action. All observers (including enumerators, optometrists and ophthalmologists) take part in a comprehensive training course, which has been developed for conducting the protocol. The course includes a full spectrum of education to ensure that all investigators have a broad based knowledge of the study process, study purposes, data forms, and technical skills needed to conduct the protocol in a scientifically sound manner. All staff must complete the training course prior to getting involved in the study. The program director and manager directly supervise the staff training process. All observers receive regular quality control visits from the project manager who checks their performance. In addition, the data are reviewed periodically, and feedback is given to the observers weekly. In order to assess the protocol, sampling process, participants' transport, data forms, equipment, and interobserver agreement, a pilot study is done one month before starting the study. The pilot study is done on 3 clusters in different districts outside those selected for the main study. To determine the reliability coefficient for visual acuity and refraction, the procedures are repeated twice by two series of observers. The agreement rates are calculated. The study is approved by the Research and Ethics Committee of Noor Vision Correction Center and Ethics Committee of the National Research Center for Medical Sciences. All subjects included in this study will be informed about the project and the procedures in their native language before being enrolled. They will be informed that their participation is entirely voluntary and they may decide to withdraw from the study at any time. The participants' agreement for examination will be obtained verbally. The confidentiality of all study participants will be protected in accordance with a good epidemiological practice. During the enumeration process, as data on each household is completed, a supervisor will do a quick check to see that all data is collected properly. Similarly, during the eye examination at the clinic, as each person completes the eye exam, the supervisor checks all data forms to ensure that all relevant data has been collected. Missing data and mistakes are rectified after consulting the concerned person. During data entry, the forms will be checked for completeness and consistency by the data entry software. If the forms are not filled in completely, the concerned person will be consulted to fill in the missing data or clarify an inconsistent data. All changes and coding will be made in ink by crossing out the original data and recording the new data beside it. It will be signed and dated by the person making the changes. Overwriting will be avoided. In calculating standard errors and the 95% confidence interval for categorical and continuous variables, the cluster sampling design is taken into account and adjusted for. In addition to descriptive analyses, odds ratios are calculated with multivariate logistic regression in order to control potential confounding variables, and account for cluster design effects. A familial association of qualitative variables may be assessed by an odds ratio (OR)  that, for any pair j and k of individuals in a family, is defined as the odds of person j having an outcome given person k has the same outcome divided by the odds of person j having the outcome given person k does not. To adjust for possible confounding variables, we will use the second-order generalized estimating equations (GEE2) approach to logistic regression that simultaneously models the risk of a person having myopia and the familial associations. [41, 42] In order to assess the degree of familial association for quantitative variables (e.g., spherical equivalent and cylindrical power) we computed Pearson correlation coefficients for all possible pairs of siblings. All analyses will be done using STATA statistical software, version 6.0 (STATA Corporation, TX). This study protocol describes the study design and eye examination of a cross-sectional population-based study in Tehran population. We expect that findings from the TES will show the status of visual problems and their causes in the community. This study will highlight the people who should be targeted by intervention programs for prevention of visual impairment. Special thanks are given to Dr Ronald Klein, the Beaver Dam Eye Study; Dr Rupert Bourne, the National Blindness and Low Vision Prevalence Survey of Bangladesh; Dr Leon Ellwein and Dr Praveen K Nirmalan, the Tirunelveli eye survey; Dr Montserrat Martin-Baranera, Survey of blindness in Bioko, Equatorial Guinea, all who kindly have provided us the protocols and data forms of their studies. We also thank Dr Kamran Hojat Jalali and Dr Azam Alimardani for their helps in preparation of the eye examination protocol. This project is supported in part by Noor Vision Correction Center, and a grant from the Iranian National Research Center for Medical Sciences. The selection of clusters is done based on blocks enumeration of the national census of 1996 by the Iranian Statistics Center. HH, the director of the project, participated in the design of the study and the examination protocol, and he will supervise the examination process. AF, the manager of the project, participated in the design of the study and will coordinate the study. He drafted the manuscript and will participate in the statistical analyses. KM participated in the design of the study and will participate in the statistical analyses. All authors have read and approved the final manuscript.